Who else like Ian Kilbride at Warwick Wealth is going to appreciate the benefits of supporting ‘My’ opera Lost in a Bluebell Wood composed/written by Rexleigh Bunyard and produced by Arnold Cloete of Gauteng Opera? Help take the ‘dis’ out of disability!” Coincidences??? ‘My’ opera, “Lost in a Bluebell Wood” will cost money. We need to raise a million rand to get it into production. But, we are making headway! In early December we drove to Prince Albert to see Nicky Rebelo in his one man show The Kreutzer Sonata. I was looking out the window, daydreaming. Suddenly my dreams were halted by this red and blue sign on the fence of the Oudtshoorn bowls club. It seemed to jump out at me. WARWICK WEALTH it said in its bold lettering that couldn’t help but catch my eye. Warwick Wealth, I wondered, before my attention was caught up by the scenery of that wonderful drive over the Swartberg Pass. About two weeks later I was at my friend’s golf club when I saw the name Warwick Wealth again, this time on a beautiful clock. Making enquiries I discovered that Warwick Wealth was actually a financial institution. For reasons I can’t explain I felt I must contact Warwick Wealth and see if they would be interested in advertising on my blog. I sent off a letter to the CEO, Ian Kilbride, and got no response. Not being one to be put off at the first hurdle, I sent off a further letter. This time I decided to concentrate on the sponsorship money required to produce Lost in a Bluebell Wood. Much to my delight, I got a response! “When you are next in Cape Town, please contact my secretary and make arrangements to see me.” Little did the poor man appreciate that he was going to see me sooner than he thought. At that very moment, I was visiting my sister in Cape Town! By the end of the day the appointment was made for two days hence. Now all I had to do was to find out whereabouts in Cape Town Warwick Wealth were based. 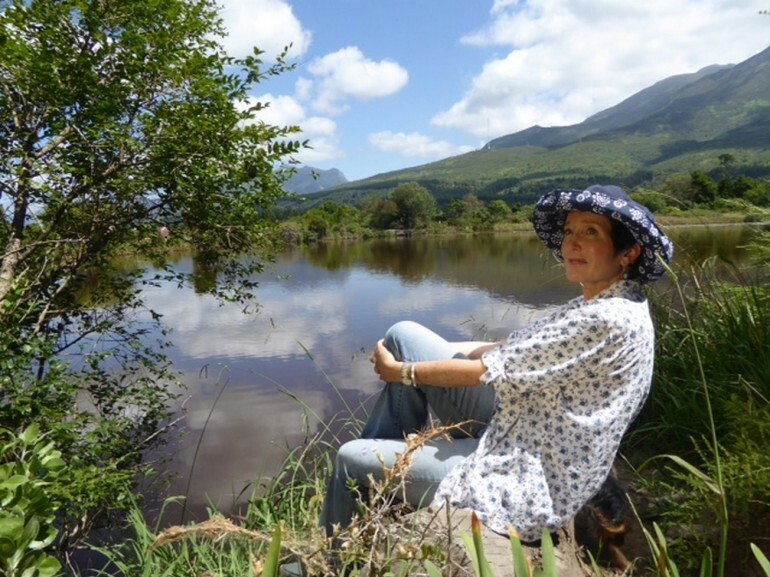 Incredibly I discovered they were only two minutes drive from where Liz lived in Constantia. Fortunately my best friend and blog publisher, B, was also in Cape Town and was able to come with me for moral support. We found the offices in the glorious grounds of the Alphen Hotel. Nervously we sat in reception, refusing the kind offer of tea and coffee. After about twenty minutes I heard my name being called. Seeing this man striding towards me, I stood up, willing my spastic arm to behave itself for the handshake I knew was about to follow. B handled the monetary side of ‘ear ‘ear, so I decided to let her take the lead on financial matters, I could always chip in. I wanted to fling my arms around this incredibly generous man and give him the biggest hug. But I behaved in a properly dignified manner, spluttered out a thank you and grinned inanely. And so, we have raised about one fifth of my opera-mega sum. Thinking back on the raising of that first R200 000, I am just so aware of God’s work throughout. I don’t believe in coincidence. There was too much that just fit so perfectly. Bits of a puzzle that when put together formed the most amazing picture. The fact that I was in Cape Town when I got the reply; the location of Ian Kilbride’s business; his father’s Cochlear Implants; the connection Ian and I seemed to have; his Spirit Foundation which assists bright but disadvantaged children through high school which resonates within me. Maybe this can be the subject of a future blog…….. When I was a child and had failed miserably at something, I used to get so irritated at my Mother’s: “If at first you don’t succeed, try, try and try again!” I didn’t succeed in getting a response to my first letter. I want to put back my head and shout to the sky with delight that I did try again. African elephants helped this businessman settle in SA! New look for a new Era!